Looking for an online casino game that offers the chance to win real money without requiring any skill or strategy to play? Consider playing online scratchies – these easy, fun games can award instant-win cash prizes for affordable costs and are based entirely on luck. Find out more about online scratch cards and how to play for real money at the best online casinos. What is an online scratchie? Most Aussies are familiar with the concept of scratch cards. 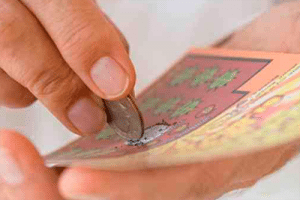 These are the small cards that can be purchased from newsagencies, petrol stations and lottery outlets, where you use a coin or other sharp object to scratch the metallic covering on the surface in the hopes of revealing a prize underneath. Online scratchies are the virtual version of these cards, using the same concept but in digital form. Instead of physically scratching the surface, you get to use your mouse or touch screen to click to reveal the panels. Thanks to their digital nature, online scratchies have all kinds of features their real life counterparts cannot offer. Software developers have implemented things like special themes, bonuses, animation and 3D graphics to make online play a lot more engaging and entertaining for players, while also offering more ways to win. Online scratch cards have become very popular with recreational punters who enjoy placing a small wager here and there. The fact there is no skill required to play and the outcome of each game is based purely on luck means scratchies offer a non-intimidating chance to win real cash. Online games cater to all bankrolls, with scratch cards available to suit casual players and high rollers. To play for real money, sign up for an account with one of our recommended online casinos. When it comes to scratchies, Guts Casino gets our top vote, offering a varied selection of instant-win games from multiple software providers that can be found under the ‘Other Games’ category in the main game lobby. Make a deposit using a trusted AUD payment method like Visa, MasterCard, Neteller, Skrill or Paysafecard and you can start playing for the chance to win real cash right away. Each online scratch card is different, but they are all just as easy to play. Choose and load the game directly over your Web browser (no downloads are needed), use the buttons to set the size of your stake, then click to scratch and reveal the panels. If you make a match, you’ll win instantly, with winnings automatically credited to your casino account ready to be withdrawn or wagered again. Are there any scratchie bonuses available? All of our recommended scratchie sites offer welcome bonuses for new players. All you need to do is sign up using our links and you will be eligible for bonuses like matched deposits and free spins, giving you more bang for your buck which you can use to play scratch cards available at your chosen site. Once you’re a member at an online casino, you will be privy to the one-off bonuses and promotions available exclusively for members. Our recommended casinos also offer loyalty reward programs to registered players, so you can earn points every time you play scratchies for real money, which can later be transferred into cash or casino credits. 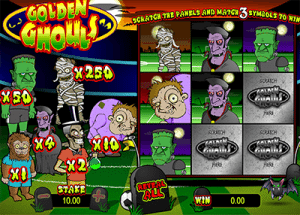 Golden Ghouls – In this Microgaming classic, a bunch of zany monsters take to the football field for some good old fashioned midnight soccer. Scratch all the panels to reveal the monsters hiding underneath and if you match three of the same ghouls, you’ll win a prize in accordance with the pay table posted to the side of the screen. There’s werewolves, zombies, mummies, vampires and Frankenstein, and you can win up to 250X the size of your bet. Make a match and the winning monster will come to life on the field, kicking goals in celebration. 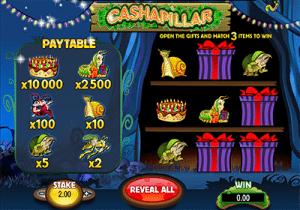 Cashapillar – Bugs and beetles aren’t usually considered cute, but they sure are in this Microgaming scratch card. Cashapillar takes us to a bugs birthday party, where caterpillars, grasshoppers, snails, rhino beetles and lady bugs dance under a string of fairy lights. When you choose a new card, you are given nine birthday presents, which you must click to reveal the gifts waiting inside. Match three items and you will win the corresponding cash prize, with the lucrative birthday cake awarding up to 10,000X the size of your bet. Hole In One – This Play’n Go scratch card is one for the golf fanatics, taking us to the putting green for the chance to scratch your way to a big one. We like that this game really puts a virtual spin on the real life scratchie experience, turning your mouse pointer into a coin that lets you actively scratch away the panels. Match any three symbols in a horizontal or vertical line to win, including golf carts, trophies, clubs and more. Not sure if online scratchies are right for you, or want to try out the different games before deciding if you want to wager any real money? Our recommended casino sites provide the option of free play, which gives you the chance to play games risk-free in practice mode. Sample as many scratch cards as you like and make an informed decision before committing to any real money bets. Sign up to play online scratchies at Guts Casino where new players can claim up to $500 in bonus money and 100 free spins to use on the pokies. Guts offers a great collection of instant-win scratch cards, including many of the popular titles mentioned above.